Be the first to share your favorite memory, photo or story of Candice. This memorial page is dedicated for family, friends and future generations to celebrate the life of their loved one. 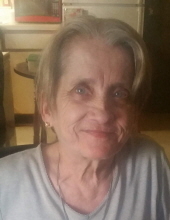 Candice Land, age 63, of Clinton, MO, died on January 17, 2019. Candice was born in Kansas City, MO, on July 17, 1955 to David and Dorothy Flavell. She was married to Robert Land. Candice is survived by her husband, Robert of the home; daughters, Teresa and husband, Shanon Short, Belton, MO and Crystal Osgood, Kansas City, MO; her son, Jerry Lee Poe, Butler, MO; 8 grandchildren and 2 great-grandchildren. Candice was preceded in death by her parents and her son, David Wayne Poe. Candice enjoyed art, and spending time with her daughter, Teresa. She was a very loving, giving woman. She loved being at home. The family plans a private service at a later date. Condolences may be left online at www.ConsalusFuneralHome.com. To send flowers or a remembrance gift to the family of Candice Land, please visit our Tribute Store. "Email Address" would like to share the life celebration of Candice Land. Click on the "link" to go to share a favorite memory or leave a condolence message for the family.